The 2019 Camry Hybrid is part of the eighth Camry generation introduced for 2018. It’s available in three trim levels: LE, SE, & XLE. The LE trim equipped with a lithium-ion battery while the higher trims use older nickel-metal hydride technology. The LE trim is the highest fuel economy rating of the three trims. X– All Accord Hybrid trims come equipped with alloy wheels vs. steel wheels on Camry Hybrid LE. 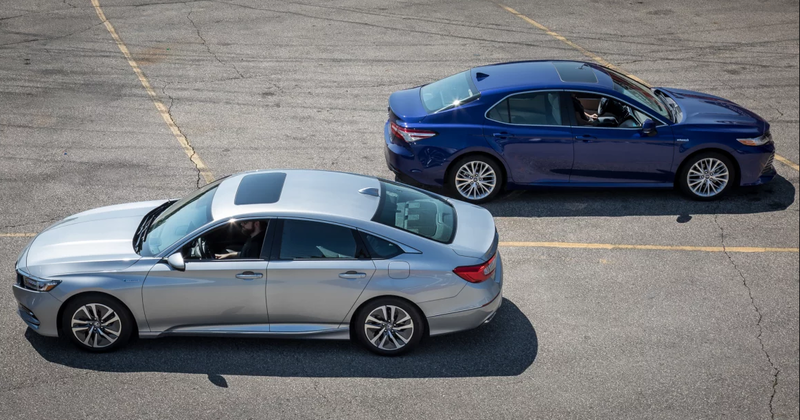 X- Accord Hybrid EX and above include a standard moon-roof vs. extra cost on every Camry Hybrid trim. X– LED low beam headlights on every Accord Hybrid trim vs. only available on top-of-the-line Camry Hybrid XLE. X– Accord Hybrid has more front head room (non-moon-roof models), more rear hip room, and more leg and should room in both rows. X– Blind Spot Information System and Cross Traffic Monitor come standard on Accord Hybrid EX and above trims. vs extra cost for Camry Hybrid LE and SE buyers. Shop our Accord Hybrid Inventory HERE! We love making it easy…shop from the comfort of your couch HERE!